Pet Force One is already serving our clients and their pets in time-saving, stress-red ucing and unique ways. Aside from the daily routine drop offs and pickups at our daycare and boarding facility, the wide variety of requests for van services not only reassures us that we are well equipped to meet any and all of them but also shows the profound bond we enjoy with man’s best friend and all the ways we express it. Here’s a sample. One client’s beloved dog requires chemo that involves trips to Virginia for treatment. Taking time off from work to drive there was becoming a problem for her. Pet Force One now covers the round trips and waits while the procedure is done. On another assignment, a couple who are divorced and share custody of their dog have Pet Force One transport him back and forth between them for visits. Not all dogs like car rides. When we got a call requesting transport to the vet for two 70 pound Greyhounds ‘who hate cars’ we wondered just how this trip would go. Our customer, Ann Marie Petrick says it best. A flat tire and failed AC on a recent very hot afternoon in Adams Morgan left a woman stranded who was traveling with her dog. She tried to get out of the heat to wait for roadside service in a nearby restaurant but they didn’t allow pets. Pet Force One picked up her buddy and took him home. Our present service area extends to transporting furry passengers to and from the airport. In the near future customers will be able to book Pet Force One for longer, customized trips through our charter program, Patrick’s Pet Care Express. We are also working on an app that will quote fees for all of our trips. In our five-years of business, we’ve been privileged to meet hundreds of dogs. One of our longest dog-walking customers is Winnie. With her easy-going manner and signature floppy-ear, Winnie is impossible not to love. We spoke with her owners Alex and Lia to find out more about their dog-owning experience. When Lia and Alex decided to get a dog, they knew they wanted to adopt because there are so many animals in need of a home. Through an animal rescue service they were able to find the perfect dog for them, and on Valentine’s Day 2014, Winnie became part of their family. While hesitant about keeping a dog in a typical DC-apartment, Lia and Alex found that through long walks and visits to dog parks Winnie gets plenty of exercise. They also include Winnie on their own excursions: s he’s been to the U.S. Senate, the National Arboretum, the Eastern Shore, and is looking forward to trying some dog-friendly ice cream in their neighborhood this summer. If you’re interested in adopting a dog like Winnie, come to our upcoming adoption event on Columbia Heights Day, June 17th. From 12 PM – 3 PM the Humane Rescue Alliance will be at our day care with adoptable pups. “Patrick’s Pet Care, a leading pet services company in Washington D.C., today announced it will offer pet transportation services throughout the DMV area, making it one of the first DC pet care company to do so. The service is taking off June 1st, 2017. ‘Pet Force One,’ the company’s new van, is designed to provide safe, reliable access to key locations like the vet, groomer or airport. It features air conditioning, individualized transport spaces with water dispensers, and disposable floor mats. Recently named Best of DC in a city-wide survey, Patrick’s Pet Care has become a leader in the DC dog-walking, pet-sitting, and pet-boarding industry. COLUMBIA HEIGHTS, NW, DC— Patrick’s Pet Care, a leading pet services company in Washington D.C., today announced it will offer pet transportation services throughout the DMV area, making it one of the first DC pet care company to do so. The service is taking off June 1st, 2017. ‘Pet Force One,’ the company’s new van, is designed to provide safe, reliable access to key locations like the vet, groomer or airport. It features the latest pet-friendly climate control, individualized and private transport spaces with filtered water dispensers, and gps-tracking. Recently named Best of DC in a city-wide survey, Patrick’s Pet Care has become a leader in the DC dog-walking, pet-sitting, and pet-boarding industry. Ultimately, this transportation service means no part of the city is off-limits for pet owners. Whether that’s a visit to a dog trainer, the airport, or Patrick’s small dog day care, Pet Force One will get your pet there, fast and in style. Patrick’s Pet Care is a rapidly growing dog-walking, pet-sitting and pet-transportation firm with a small-dog day care based in Columbia Heights, Washington, D.C. and plans to open a dog day school in Brookland, NE this fall. In its fifth year of operation, the firm services more than 140 customers daily in 15 neighborhoods. Since its inception, Patrick’s Pet Care has focused on providing environmental-friendly, reliable, and personalized animal care. The company uses ”Pet Check Technology” which includes GPS-tracking for walks, online scheduling and billing, making it easier than ever to help care for pets in real-time. By maintaining high standards of customer care, Patrick’s Pet Care can expand its services without losing their community-focused spirit. Along with a five star rating on Yelp, Patrick’s Pet Care was voted “Best of DC” in 2017 by Washington City Paper. To find out more, visit www.patrickspetcare.com and follow us on Facebook, Instagram and Twitter. What does community mean to you? For 25 Columbia Heights residents, it means venturing out in the pouring rain to clean up Columbia Heights Dog Park on Earth Day. Despite the weather, representatives from District Bridges and the 11th & Bark Organization as well as DC Councilmember Brianne Nadeau arrived to lend a helping hand. In recent years the Columbia Heights dog park had fallen into disrepair and needed some TLC. Since the park is such an important part of our community we organized an event to clean it up, partially funded by a grant supplied by Columbia Heights ANC 1A. We arrived at the p ark bright and early with gray clouds threatening a storm. Despite this, by 8:30 AM a crowd of volunteers had gathered, eager to get to work. Some removed trash and old toys, while others reinforced the fencing that protects small dogs from escaping the park. Neighborly Lawns led the largest project: installing a drainage tube to prevent rainwater from seeping mud onto the pavement. As everyone set about their tasks, tunes blasted from speakers brought by volunteers. Two benches were donated, giving park attendees a place to lounge as their pups romp in the park. Patrick himself cut the overgrown grasses around the perimeter and set up a water cistern along the back side of the park, meaning dogs will have a sustainable water source for the upcoming hot summer. By the end of the morning, the park was looking beautiful. After hours of hard work in the rain, volunteers returned to Patrick’s day care to feast on pizza donated by RedRocks pizzeria. Regardless of the damp conditions, the clean up was successful thanks to everyone who gave their support. Thanks to New Columbia Heights for featuring us! Read the original article here. This is neat. The folks at Patrick’s Pet Care on 11th are planning a clean-up of the dog park at 11th and Park, scheduled for Earth Day, April 22. The dog park, which is owned by Metro, is popular but has seen better days. If you’d like to help, here’s more info about the event. You’ll get lunch from Red Rocks if you help out too! Thank you to Petworth News for this feature! Click here for the original post. A good friend of mine started a pet care business five years ago, and he has grown it into one of the leading pet care businesses in DC due to happy customers and happy pets. 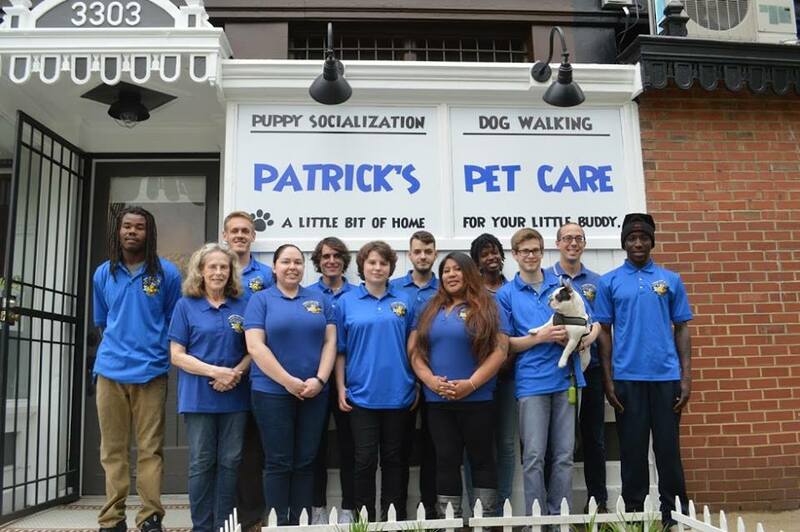 While initially a one-man show run by owner Patrick Flynn, Patrick’s Pet Care now serves nineteen neighborhoods in both northwest and southwest DC and employs about 11 employees. While Patrick’s Pet Care was founded in Columbia Heights, it’s Petworth customers who really helped the company get its start. Read more and learn about a Petworth News reader discount! More than just a dog-walking company, Patrick’s opened a small dog day care in 2016 at 3303 11th St NW. Anyone walking to brunch on 11th Street has seen the cute pups playing or napping through the day care’s sun-filled bay windows. Never overcrowded, the day care champions human-animal interaction. A manager supervises the dogs throughout the day, takes them out on private walks around the neighborhood, and makes sure they are all happy and getting along. Patrick’s Pet Care also offers services for cats and other small pets at customers’ homes, including daytime visits for feedings, cleaning the litterbox, and providing additional house care. If you don’t want to leave your cat at home alone, Patrick’s Pet Care can board them at their own facilities. What sets Patrick’s Pet Care apart is their overarching focus on providing the highest quality care for clients, pets and employees. Clients can schedule visits conveniently on their phones through the Pet Check appas well as leave comments directly for the caretaker. The app also has GPS tracking which means customers can see that Patrick’s Pet Care was where they were supposed to be when they were supposed to be there. After every walk, pet sit, or day of day care or boarding, the caretakers send an email with a summary of the visit, including cute notes, pictures and videos. This type of open communication means every pet gets the individualized care they need and every customer can feel confident when they are away from their pet. For employees, Patrick’s Pet Care means a positive, stable working environment. Every employee makes a living wage of at least $15 an hour, meaning they can afford to live in the neighborhood they serve. Ariana Goode is a Petworth resident who has been working at Patrick’s Pet Care for over a year. “While I’m not originally from DC, I feel a part of the community because I live where I work. I love seeing my clients enjoying their pets just as much as I enjoy taking care of them. Working at Patrick’s Pet Care means that you’re joining a family that loves people and pets alike.” With such a supportive workplace, the staff is able to get to know the pets they care for over months and even years. This leads to stronger relationships between the animals and their caretaker. Patrick’s Pet Care also puts an emphasis on giving back to the community. This year they are sponsoring Celebrate Petworth to show their support for the neighborhood which has always supported them. Patrick and his team will be in attendance, providing water and treats for any dogs enjoying the festival. This type of local-engagement is a priority of Patrick’s Pet Care and an ode to their small-business roots. By maintaining their high standards of customer care, Patrick’s Pet Care hopes to expand business throughout DC without losing their community-focused spirit. No matter how many neighborhoods are served, every pet will receive the personalized attention and specialized care that has made Patrick’s a pillar of DC pet care. To learn more about Patrick’s Pet Care, visit them online. New Petworth News customers can receive 50% off their first visit by using the code *PETWORTH17*. You can also visit their Facebook page, check out cute pics on their Instagram page and follow them on Twitter.